The story titled “Minister slams criticism, saying ‘Government not poor’” published on page 2 of the Weekend Observer is so ironic. 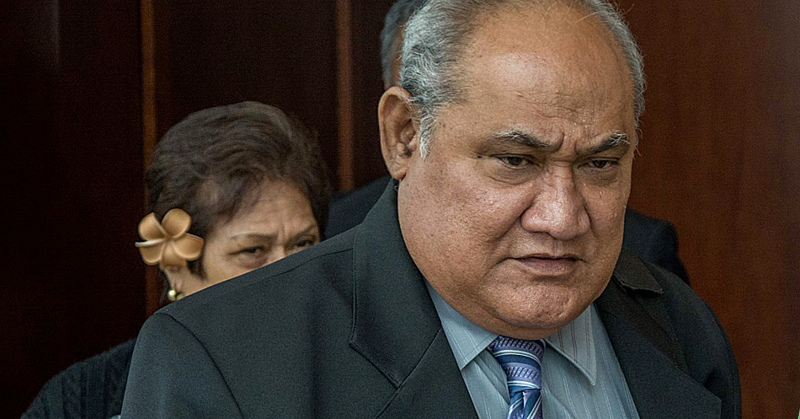 The story in question quoted the Minister for Revenue, Tialavea Tionisio Hunt, hitting out at people who are claiming that the Government is poor and needs money. Let’s park it there for a moment. What “rubbish” is the Minister referring to here? That the government needs money? Or that it’s poor? When we flip the coin, we’d hate to think for a moment that the Minister is suggesting the Government is so rich it doesn’t need any money. Now the Minister did not name the people who have been saying such nasty things. All we know is that he was so upset by people saying that the Government is broke he just wanted to set the record straight. “The Government is not poor!” he reminded again, emphatically. The Minister pointed to the Ministry of Revenue’s Annual Report for the Financial Year 2017-2018 which recorded their revenue collection at $507.6 million, making it the highest ever collected by the Government in a financial year. And this money, the Minister said, goes right back to the development of the country. “The Government pays out millions for the pensioners, as well as overseas referral programmes for patients seeking medical treatment overseas, among other projects. “Also was there ever a time any pensioner did not get their monthly allowance from the Government? “Currently, the Government is connecting water to family homes in Aleisa, Faleasi’u and Fasito’o, something that has not happened before, and so for the public to say the government is poor is stupid and wrong. Well that’s fantastic, isn’t it? The Minister of Revenue surely deserves a pat on the back for doing such a stellar job, not just collecting revenue but also not staying silent against those “idiots” and “fools” who say the Government needs money. Which begs the question then; if the Government has so much money – as Minister Tialavea says - why has our foreign debt become so high it is threatening to bury us all alive? Indeed, if the Government was doing so well, why do they feel the need to tax anything and everything that moves in this country? Look at what they have done to those Church Ministers, who are referred to as ao o fa’alupega, whom our ancestors never dreamt of treating this way? Ladies and gentlemen we want to remind again today that until last year, for 55 years since Independence, members of the clergy were not required to pay taxes on their alofa. That’s because the economy could obviously function without them. Besides there was no financial hole the Government was under so much pressure to fill. Today, it is a different story. With the Government having racked up a massive debt no thanks to so many white elephants, corruption and abuse, this Government has dug up such a big hole they are now resorting to desperate measures to find a way out. Which is why the insistence by the Minister of Revenue that the Government is not broke and that it’s not poor is ironic. The way we see it, it’s almost a case of forcing yourself to say it until you actually believe it’s the truth when clearly it’s a lie. When you stop to analyse everything that is going on in this country today, the cost of most things have increased beyond what people can afford. Can this Government tell us that this is a sign of a Government not desperate for money? Just last week, it was revealed that the Samoa National Provident Fund is looking to increase member contributions. Why? Have they not seen how tough the times have become in terms of the economy? We can go on and on but you get our drift. Sometimes these politicians should stop for a minute and listen to themselves. Someone should also remind them that this not a nation of “idiots” who cannot see what’s happening. The questions are: How did we arrive to where we are today? And how do we get ourselves out of it? Have a beautiful week Samoa, God bless!